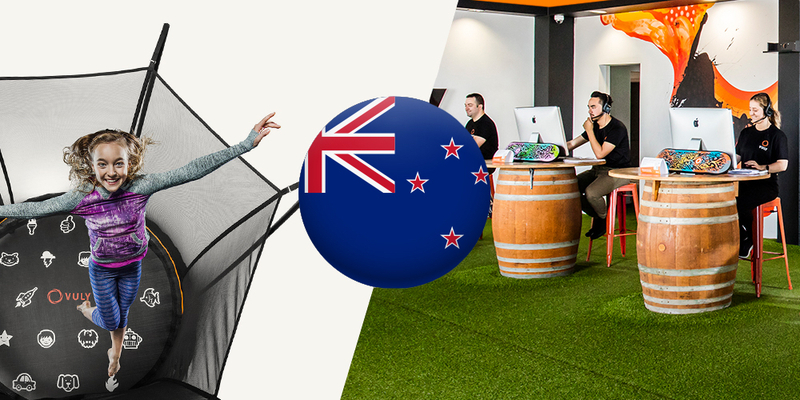 After almost 10 years in Australia, Vuly is finally crossing the Tasman and officially launching our amazing trampolines in New Zealand! From Spring 2017, Vuly will offer the Lift and Thunder through a Vuly Play online store specifically for those shopping in New Zealand. The full Vuly range – including Lift Pro, Thunder Pro and 360 Pro – will follow in 2018. Vuly is currently engaging with both major retailers and a host of independent stores to bring the full “bounce before you buy” experience across New Zealand. Our sales and support team will continue to be based in Brisbane, but we’ll strive to provide the same level of support for our neighbouring customers as we do for those here in Australia! We’re also partnering with Mainfreight – the largest carrier in New Zealand – for a comprehensive warehouse and logistics solution located on the North Island to ensure smooth and efficient deliveries. While Vuly has expanded across the world – into countries in the Middle East, USA, Canada and Europe – through a distributor model, the step into directly servicing an entirely new country is one that we’re beyond excited to be taking with New Zealand. It’s a country with such close ties to Australia, and we’re confident that New Zealanders share our love of both outdoor play and staying active. The safety innovations that Vuly has pioneered continue to be the best in the world, and New Zealand families will receive the same Half-Price Parts for Life guarantee and industry-leading warranties as our Australian customers. Keep an eye out for Vuly in retailers throughout New Zealand and for the dedicated Vuly Play online store this holiday season! We’re ready to make this 2017 a very Vuly Christmas for New Zealand.